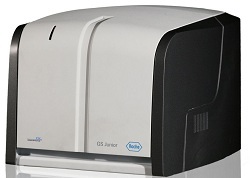 A SOFTWARE upgrade for Roche’s 454 GS Junior benchtop next-generation genomic sequencing system promises better sequencing consistency. The 454 GS Junior is a benchtop version of the Genome Sequencer FLX, and says Roche has become well established in a number of fields of research, including infectious disease, cancer, environmental microbiology, and agriculture. Further improvements are in the pipeline, and will be available later in 2012 and in 2013. These will include improvements to the machines ‘long-read’ capabilities, and automation of the library preparation and emPCR (emulsion polymerase chain reaction) workflow. Today’s announcement brings the installed software to version 2.7, with improvements to the GS De Novo Assembler, GS Reference Mapper, and GS Amplicon Variant Analyser. New protocols for paired end sequencing (3kb, 8kb, 20kb span) using the GS FLX Titanium Rapid Library Preparation Kits are also now available. These enable simple sample multiplexing for paired end projects and reduce overall preparation time. Roche says that these changes, along with the further improvements coming soon, will ease the transition of projects from traditional Sanger sequencing to next-generation 454 sequencing for many laboratories around the world.